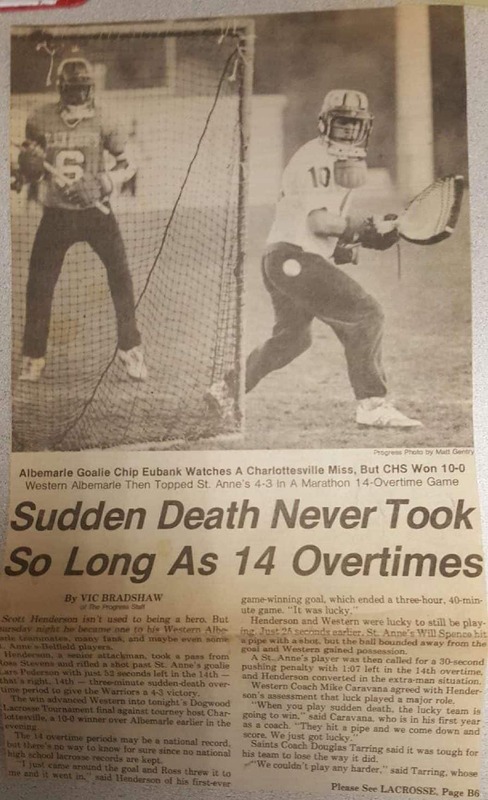 The more overtimes, the more the pressure mounts, which is why LaxRecords.com is highlighting the most overtimes in boys' lacrosse history. To qualify for this list, teams must be playing a varsity schedule and play at least four overtimes. Games are added to this list as discovered. This list is expected to be incomplete as not all states and teams report statistics. I am publishing an incomplete list now in hopes of participation from our readers. To submit a performance to the national records list, have the head coach or an official team statistician e-mail information to Mike Loveday. I recorded a podcast with the Western Albemarle (Va.) and St. Anne's-Belfield (Va.) coaches who were involved in the 14-overtime game. It's great to hear how each coach approached the game and overtimes.